With the collapse of Australia’s oversees aid program into the Department of Foreign Affairs and Trade (DFAT), Australian aid has become much more strongly aligned to the logic of security and in particular, propping up the detention industry. In Cambodia, this means orientating the aid program towards the controversial ‘Australia-Cambodia refugee deal‘ – whereby DFAT will provide the government of Cambodia with $35 mill in exchange for providing Cambodia as a dumping ground for asylum seekers. 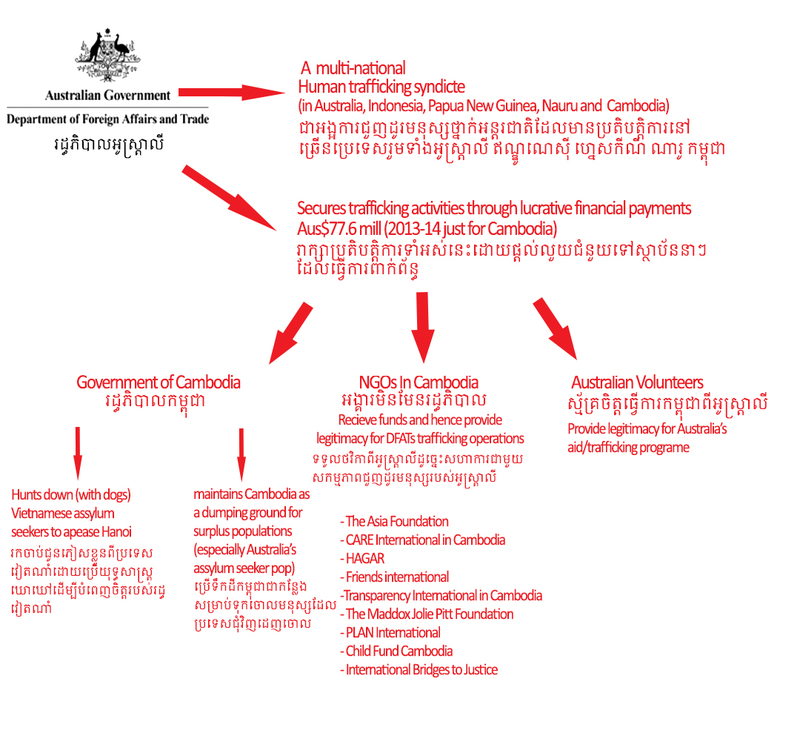 This places NGOs in Cambodia who receive funding from DFAT in an awkward position – in that they now receive their funding from the same agency that is helping to secure the Australia-refugee deal. NGOs working in the field of governance/corruption/gender are now complicit in Australia’s refugee/human trafficking operations – providing DFAT with an alibi in the form of small highly visible projects that give the impression that Australian aid is fighting human rights abuses, ‘corruption’ and ‘gender inequality’. In an aid dependent country such as Cambodia, most NGOs have become complacent with the donor funding structure, putting their own short term survival ahead of meaningful political work. For instance NGOs have been eerily silent on the Cambodian government hunting down highland Vietnamese asylum seekers with dogs in the northeastern province of Ratanakiri – an action that appeared to receive tacit support from the Australian embassy. NGOs such as The Asia Foundation, Transparency International, International Bridges to Justice, Legal Aid Cambodia, Social Services Cambodia, CARE, Cambodia Children’s Fund and Save the Children, now need to urgently ween themselves off Australian aid.